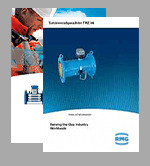 RMG Messtechnik has optimized its metering portfolio. Products below have been discontinued from our product range. A comprehensive selection of alternative products is available. In case of any queries, please contact us directly or your local RMG contact team. We will be happy to assist you.